Tempering System for Aluminum Alloy - L&L Special Furnace Co, Inc.
L&L Special Furnace Co., Inc. has manufactured two Model DRQ2436 high-uniformity annealing furnaces with semi-automated quench tanks, quench media coolers and a centralized wash station for an industry-leading supplier of aerospace fasteners and connectors. The annealing process occurs when the parts are evenly heated to 1,100ºF/530ºC and held for a predetermined amount of time. Temperature uniformity is critical for this process, and both ambient and load temperature must maintain ±10ºF throughout the cycle. The furnace is manufactured in accordance with the pyrometry specifications of ASM2750E. All thermocouple reference ports along with TUS survey ports and recording devices are included. There is a 7-1/2 HP fan to aid in temperature uniformity, as well as a reinforced baffle system with adjustable louvers to direct air flow. Three-zone SCR power control and a variable drive speed control for the fans guarantee high uniformity. The parts are placed in several 12”x12”x8” baskets and loaded into the furnace on a roller loading tray. They are then run through the annealing cycle. A stack light and signal at the end of the cycle indicate the parts are finished. The parts are then manually transferred to the quenching station, and automatically quenched within 20 seconds of the door opening. 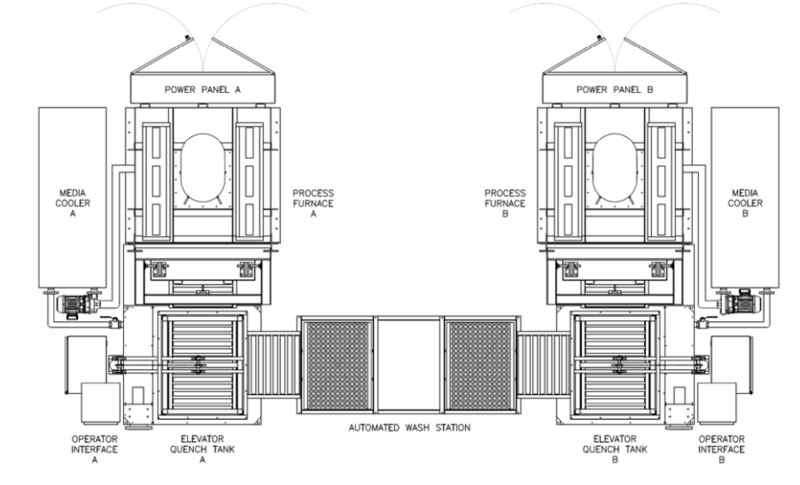 After the quench cycle is completed, the parts transfer by a spherical roller table to a wash station that is centrally located between the two furnaces. They are then raised and lowered by a series of pneumatic cylinders into the wash tank. There is an independent operator station for each furnace. Multiple programs are entered for different cycles. The operator station holds all of the interface components necessary to run the furnace. The power panel is centralized to help save space. 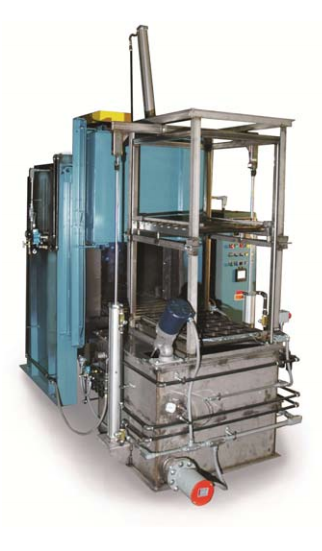 The DRQ2436 is ideal for high-production facilities as well as smaller operations where processing aluminum parts to very specific aerospace regulations is required. Options include a variety of control and recorder configurations. A three-day, all-inclusive startup service is included with each system within the continental US and Canada. International startup and training service is available by factory quote. The furnace has been surveyed and is capable of ±10ºF/5.5ºC at various temperatures up to 1,100ºF/530ºC throughout the work envelope of 24” wide by 24” high by 36” deep. Other sizes are available. If precise temperature control and uniformity is a key to your process, then L&L’s DRQ series is a great choice. L&L Special Furnace Co, Inc. Copyright ©2019 L&L Special Furnace Co, Inc.. All rights reserved.